Source: U.S. Energy Information Administration. Annual nuclear fuel costs from the Electricity Utility Cost Group (EUCG) Nuclear Committee data. Monthly wholesale power prices from SNL Energy. Note: Quark spreads are calculated using the day-ahead, on-peak and off-peak power prices for the MISO Illinois Hub (representing the Midwest) and the PJM Western Hub (representing the Mid-Atlantic). Average nuclear fuel costs aggregated on a regional level were provided to EIA by the EUCG Nuclear Committee on a $/MWh basis. Quark spreads—a measure of the potential profitability of nuclear power plants—have fallen in recent years largely because of falling wholesale electricity prices. A quark spread is the difference between the wholesale electricity price received by a nuclear power plant owner and the cost of fuel needed to generate the electricity. Since 2012, quark spreads in the Midwest and the Mid-Atlantic (see chart) have ranged between about $10 to $35 per megawatthour (MWh). Lower natural gas prices have contributed to lower wholesale electricity prices. Nuclear fuel costs are more stable than fossil fuel costs. Natural gas costs, and to a lesser extent coal costs, experience more short-term volatility than nuclear fuel costs. Nuclear power plant fuel costs are typically much lower on a dollar-per-megawatthour ($/MWh) basis than coal or natural gas plant fuel costs: in 2011, the estimated average national fuel costs for coal and natural gas plants were $25/MWh and $36/MWh, respectively. In contrast, the national average cost of nuclear fuel was $6/MWh. As a result, given the same wholesale electricity price, nuclear power plants generally produce more revenue net of fuel cost on a dollar-per-megawatt basis than coal- or natural gas-fired plants. Wholesale electricity prices in the Mid-Atlantic and Midwest regions depend primarily on the cost of fuel used by the marginal (highest operating cost) generating unit. This is typically a natural gas-fired unit in the Mid-Atlantic and a coal-fired unit in the Midwest. Given the relatively low cost of nuclear fuel, nuclear units always operate as baseload, dispatched—or, running—throughout the day and night. 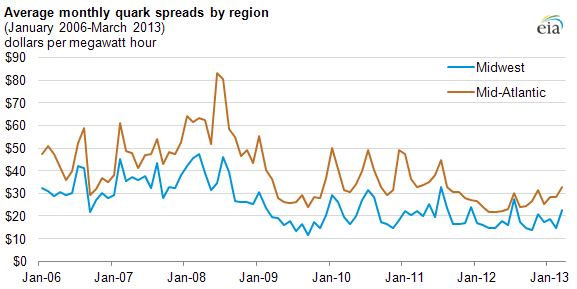 Changes in wholesale electricity prices directly drive changes in quark spread values. Natural gas and coal spreads are typically calculated based on daily or weekly spot prices for the underlying fuels, while for the purposes of this analysis, nuclear fuel costs are calculated on an annualized basis. Because nuclear power plants are always operated as baseload, their fuel prices can be more easily annualized. Because wholesale electricity prices tend to be higher in the Mid-Atlantic region than in the Midwest, nuclear power plants in the Mid-Atlantic typically have higher quark spreads (see charts below). Average monthly wholesale electricity prices were significantly higher in 2007 and 2008 than they were in 2011 and 2012, especially in the Mid-Atlantic. 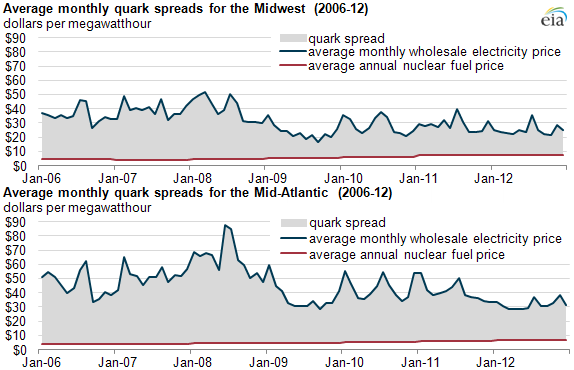 Therefore, the quark spread for a nuclear power plant in the Mid-Atlantic in 2007 was higher than it has been recently. As with dark (coal) and spark (natural gas) spreads, the quark spread calculation does not take into consideration other costs associated with the generation of electricity, such as routine operating and maintenance (O&M) costs or long-term capital investment. It also doesn't take into account other sources of revenue such as capacity market payments. In that sense, a quark spread is an indicator of market conditions, but it is not necessarily an exact measure of profitability for any one nuclear power plant. The recent narrowing of quark spreads may affect investment decisions for plants that anticipate major capital expenditures or increasing O&M costs in the near future. Nuclear plants owned by vertically integrated utilities under cost-based state regulation may be in a better position to recover increases in plant expenses by passing them through directly to ratepayers, after approval by the state public utility commissions. In contrast, merchant plants are more directly reliant on the wholesale electricity market for the revenue necessary to recover these costs.